WRFXRR - Va Very light! "Bought this to replace a weak trail tech battery on a kickstart bike. 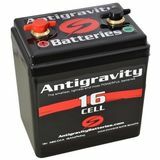 The dimensions are slightly different but they are similar in size but this anti-gravity is very light with more amp hours." RKGRACING Tons of cranking power! "Finally bought one of these and I wish I would have done it sooner. My sons YFZ 450 cranks faster and starts quicker with this battery."